The developer plans to submit a site plan to the city that conforms to the OMB decision, and meets the city's zoning requirements for such items as parking, setbacks, landscaped area and other matters. 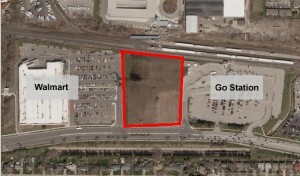 The Molinaro Group has acquired the vacant lands between the Walmart and GO station on the North side of Fairview Street. In 2008, the former owner secured a decision on these lands from the Ontario Municipal Board (OMB) that allows a maximum of 20 storeys, and no limit on the number of units. The developer plans to submit a site plan to the city that conforms to the OMB decision, and meets the city’s zoning requirements for such items as parking, setbacks, landscaped area and other matters. I have met with city planning staff and the developer to plan opportunities for public input. The height and density has been determined, but the public can provide input on site planning matters, which include design, landscaping, amenity features, streetscaping, lighting and suggestions for the ground floor commercial units. The developer is interested in getting your input prior to submitting their final site plan application later this fall. To provide you an opportunity to share your feedback, I will be hosting a design workshop later in October (date and venue to be determined), with the participation and cooperation of city staff and the developer. Because there is likely to be considerable interest in this project, including from residents outside Ward 2, please RSVP your attendance to my assistant Georgie Gartside at gartsideg@burlington.ca to help in booking a large enough room. My Take: I’m supportive of redeveloping lands near our transit stations. Burlington GO has been identified as a “mobility hub” by the province, and major commercial/residential redevelopment is expected to take place along mobility hubs and GO lines. The scale of the project has already been determined by the Ontario Municipal Board, so we as a community need to focus our efforts on the matters we can influence during the site plan process to ensure the best outcomes from this redevelopment for the whole community. I’ll be looking for on-site amenities (retail and recreational) for the residents moving in – we want this to be a “complete community;” a high level of design, especially facing the street; greenspace for residents to enjoy; a mix of housing size and price to provide a range of housing opportunities, and other matters. This development, done well, can be a catalyst to redevelopment along Fairview from strip plazas and parking into a complete streetscape that is as enjoyable to walk or cycle as drive.